The Galaxy Nexus is the first Android phone to ship with Android 4.0 or "Ice Cream Sandwich"
The Galaxy Nexus is the first smartphone to run the latest 4.0 "Ice Cream Sandwich" version of Google's Android operating system. Thanks to online store MobiCity we've managed to get our hands on this impressive smartphone well before its official release in Australia. So let's take a first look! I've spent my first weekend with the Samsung Galaxy Nexus and my overall impression is very positive. I can say it up front right now: the Galaxy Nexus is without a doubt the best Android phone on the market right now and the best Android phone that's ever been released. It's the only Android phone that I would ever ditch my iPhone 4S for. 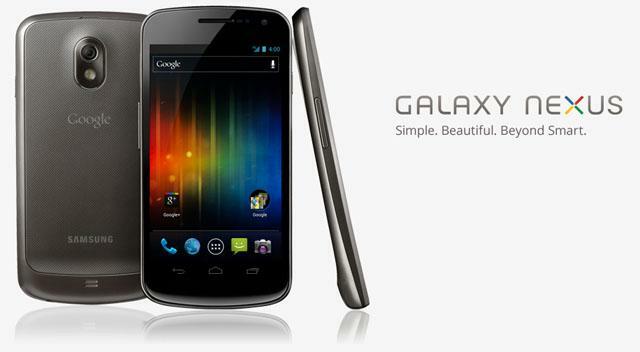 There are a few reasons why the Galaxy Nexus is the best Android phone on the market. The first is its display. It's a strikingly large 4.65in Super AMOLED HD display — the HD denotes a high definition resolution of 1280x720, and the Galaxy Nexus displays an ultra sharp and crisp image. Its bright, vivid and clear and text is crisp and smooth with no visible aberrations. The large size of the screen makes the Galaxy Nexus great for video playback but the most positive aspect of the screen is reading and Web browsing: the clarity of the screen makes reading Web pages and books an impressive experience. The big screen doesn't make the Galaxy Nexus uncomfortably large. The phone has on-screen controls rather than capacitive keys that were previously standard on Android phones, so the phone itself isn't too much bigger than the popular Samsung Galaxy S II. Aiding the look and feel is a curved screen and a body that has a teardrop profile — this means the Galaxy Nexus is thicker at the top and slightly wider towards the bottom. The curvature makes the Galaxy Nexus feel natural to hold and therefore comfortable to use. The hardware on the Galaxy Nexus is only half of the story, though. Google's latest Android software, Ice Cream Sandwich, is the star of the Galaxy Nexus show and the changes are both exhausting and impressive. The entire user interface has been refreshed to create a more uniform look and feel. It's faster and slicker than any previous Android software. It feels more consistent and easier to use. The camera shutter is staggeringly fast: there is almost zero shutter lag, so images are captured as soon as you press the on-screen shutter key. The Web browser is speedy and smooth. In my first three full days of use, the Galaxy Nexus has not crashed or stuttered once. Performance is consistently excellent. There are a few things we don't like about the Galaxy Nexus, however. The most annoying issue is the volume of the external speaker: its not loud enough so ringtones and notifications tones can be difficult to hear when the phone is in your pocket. We tried downloading an equaliser app from the Android Market to boost the volume but even with a slight boost the low volume still remained a significant issue. We can only hope Samsung might be able to fix this with a software update, but its likely hardware that's the issue. The Galaxy Nexus' battery cover is way too fiddly and difficult to put back on once its removed. You really need to press it with force to click it back into place. On my review unit, there is a small spot on the edge of the cover that moves when you press it, suggesting its not clicked into place properly. It's only a minor issue but the fit and finish is a step behind the iPhone 4S — the plastic feels durable but it doesn't look or feel as sturdy as a premium device should. We do really like the non-slip grip that the back of the Galaxy Nexus provides, but we wish Samsung paid more attention to detail when it comes to the fit and finish of its phones. We love most of the changes that Google has made to Ice Cream Sandwich, but Face Unlock isn't one of them. Its largely a gimmicky feature in the first place, but we found using it a hit and miss affair. Sometimes it worked flawlessly, but other times the front facing camera was affected by a lack of light (especially if I used it indoors) and the unlock didn't work. In the end, we switched it off and used the regular pattern or PIN unlock. We also found an annoying issue in the new People app. The interface and layout is excellent but the images the app pulls from your contacts look distorted and pixelated. Though its ultimately a minor issue, this takes some gloss of what should be a great UI. You can get around this by replacing your contact images with ones taken with the Galaxy Nexus' camera, but even then, the image inside the contact menu is blown up and looks a little blurry. I've also discovered some apps in the Android Market aren't compatible with the new Ice Cream Sandwich software. Some apps like Facebook will work but are missing the ability to access the options menu due to the on-screen keys replacing the hardware buttons. Others, like RemindMe, don't work at all. This is an issue that will be resolved over time as developers update their apps to support Ice Cream Sandwich, but it remains a stumbling block for early adopters. Two more minor issues — I hate the headphone jack on the bottom of phones and the Galaxy Nexus is no exception. It feels out of place and requires you to turn the phone around when you pull it out of your pocket. I also noticed that the volume buttons on the Galaxy Nexus are too easy to accidentally press when the phone is in your pocket. I'll be publishing a full, comprehensive review in the coming week, but in the meantime if you have any questions or thoughts on the Galaxy Nexus, please let me know in the comments below!